So, instead, here are a few of the awesome Jessica polishes I ordered a couple weeks ago. Casablanca. A sheer-ish black base with pink/blue/teal duochrome shimmer. This has a ton of duochrome in the bottle, but the effect is more subtle on the nail. It needs bright sunlight to be visible, but it also shows up in sunset light quite well. 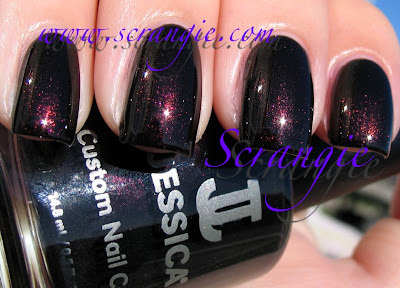 It reminds me of one of those sweet black/duochrome shimmer Nicoles, but I can't remember which one. Blues In The Night perhaps? Glamorous Gladiator. A warm brown-bronzy shimmer with a splash of opal flakes. Jessica has a flaky polish! I had no idea. This reminds me a bit of OPI Shim-Merry Chic, but less "barflike" (as I've heard it called, lol!! )- it's richer, more saturated, a little deeper and bronzier. Not as many flakes and no glitter, but still a very strong shimmery base. Grecian Touch. I love this type of color. Vampy colors that are nearly black, but have a glint of color that appears to be glowing like coals... Lit from within. That's what it looks like. This one is a plum-bronze-burgundy duochrome. Subtle duochrome, the color shift is most obvious in bright sunlight. Dark around the edges and glowing in the center. Midnight Moonlight. Medium blue shimmer with subtle green and purple duochrome. I think this is my new favorite blue. In the bottle this has an insane amount of duochrome, but the effect is much more subtle on the nail. In the second picture you can see a little of the green and purple duochrome. Purple at the tips of the nails and green in the center. Have I mentioned yet that Jessica's bottle pictures are the best? Extremely helpful when picking out polishes. Look at their picture of this one. Solar Eclipse. Super deep blue creme with a hint of purple. In the bottle, this one looks a lot more violet, but on the nail it's mostly a rich dark blue with just a tiny drop of purple. I've been wearing this on my toes for nearly three weeks topped with a bit of Orly Prisma Gloss in Silver and it looks stunning. It's super dark but not black. A lot of dark blue cremes end up looking black or inky but this one retains its blue-ness. Venus Was Her Name. Deep dusty charcoal grey base with vibrant purple shimmer. This is super unique. I don't have another polish like this. It looks dusty. Dusty and color shifty. In some angles/lights it looks grey, but when the light touches the surface, the electric purple shimmer lights up the deep base and it just looks soooooo cooooool. Freakin' weird. Weird and awesome. The formula on them is not the greatest, but it's not horrible. Just inconsistent mostly. I find them a little hard to control- some are kind of thick, some are normal, some are thin, but the brush is kinda soft and doesn't make a perfect U shape like other brushes. They also take quite a while to dry. Not so long that it deters me from wearing them, but long enough that I can't put my shoes on a half an hour after application. I definitely recommend a quick-dry topcoat and drying drops with these. Every little bit helps! Also, letting them dry for two minutes between coats helps speed up the process as well, but that requires patience, and... well... Sometimes I don't have a whole lot of that when I'm painting my nails! The thing about ordering on the Jessica website is that it's a little difficult to find the 'good' pictures. When you click on the custom color section from the homepage, you get the useless color dots and then you have to click ORDER to see the bottle picture. BUT, if you click 'Custom Colors' on the bottom of the order/add to cart page, it brings you to the list with the good pictures that you can click to enlarge. I'm curious about the boring colours now! ohh i really like the dark cream blue! These look so gorgeous, I love the blues that you picked out! Wow... midnight moonlight is amazing! I can't get enough of colours like Casablanca and Grecian Touch right now! Venus Was Her Name is gorgeous, and Grecian Touch looks exactly like the color I was trying to franken the other day (emphasis on trying). I always see tons of Jessica nail polish at TJ Maxx in bland colors. This brand is new to me (and I started reading this blog recently) so I wasn't aware that Jessica did interesting colors like these. Thanks! Wow, finally something fun and different! 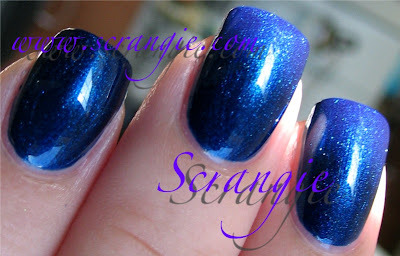 It seems like all the nail blogs are doing the same damn thing: pimping the latest polish from the same companies! Concept! Maybe a blogger buys her own stash and gives us a new idea! I really like Venus was her name! I bought at least 4 of the colours you swatched! I agree,Midnight Moonlight is an awesome shade of blue.I bought Garnet Glaze,hoping it would be as duochrome-y as the picture suggests.In real life it's pink with a subtle green flash. It's pretty,but not quite what I was expecting. Ooh I like 'Grecian Touch' and 'Venus Was Her Name'. i don't own any Jessica, I'll have to check them out! Shojo Flash, Hahaha, I'll post 'em, but they're really yawn-tastic! Gildedangel, why thank you! I've really been in the mood for these type of colors lately! Catherine, I would have to agree... I want a backup! CucumPear, AH me too, I keep wearing them over and over!! Ann Loves Beauty, TJ Maxx?! Oh man I have to go and look now, that would be a major score! Anonymous, uhh... thank you! I think? lol Although everyone seems interested in seeing nothing but new collections all the time, it gets really boring for me but that's what people seem to want. Solveig, so perfect! Love em! Pinkginger, thank you SO much, that really helps! Woohoo! I've been wanting some Jessica polishes. I love Grecian touch and Venus was her name and the blue creme one. I've been debating buying Greta too. It's always so hard to come up with orders for me without spending 100 dollars haha. but i think you will really like the greta, its glowing and rich. I hope you don't think I'm terribly nosy; I have two 90-racks hanging in my room and the second one is nearly full, plus a bucket of random polishes, so I have been exploring other storage options. Arrianne, hahaha, I know the feeling! I love these colors, especially Venus Was Her Name. I've only ever seen Jessica brand polish for sale once, in a tiny beauty supply store in Beverly Hills. I have a gorgeous brown, I think it's called Hot Fudge. I can't wait to look through their collection online. China Glaze Wizard of Ooh Ahz Returns! My first Barry M polishes!